City of Edinburgh prevented City of Glasgow Ragazzi becoming the first team to win the men’s volleyball treble with a superb Scottish Cup final victory at the Edinburgh University Pleasance. In one of the best finals for years, Edinburgh came back from 8-13 in the final set to triumph 25-20, 22-25, 24-26, 26-24, 15-13. With Ragazzi on the verge of retaining the trophy, Mike Penny held his nerve from the service line to provide the foundations for an unlikely comeback. Outside hitter Jonny Black sealed the victory with a block, making up for a service error midway through the set when he handed Ragazzi an 8-6 lead. Edinburgh had pulled a rabbit out of the hat before the match by signing Great Britain Olympic captain Ben Pipes, after a five-year career break. The 6ft 8in Yorkshireman was the catalyst and held the team together at crucial points in the match and it was no doubt he made the difference. He masterminded the Edinburgh attack with his touch and vision at the net and rallied the team when Ragazzi looked to be gaining the upper hand. Edinburgh looked to have lost the initiative when they let a 24-22 lead slip at the end of the third set, captain Niall Collin blocked in successive hits as Ragazzi snatched the set. The Capital side also let a 24-22 lead slip in the fourth set as Ragazzi clawed back to 24-24 but this time they managed to take the set 26-24 to force the tie-break set. But the match looked to be drifting away from them in the final set. A hitting error from Pipes, which he was first to acknowledge, saw Edinburgh fall behind 8-12 and then a superb block from Daniel Akungbowa gave Ragazzi a five-point lead. Edinburgh’s serving had been erratic – Black and Euan Gibson had both served long in the tense final set – but Penny steadied the ship. Edward Oldbury gave them the lead for the first time since they led 3-2 early in the set to bring up match point and Black completed the job to give Edinburgh the trophy. 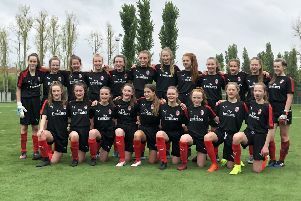 Su Ragazzi, who had beaten City of Edinburgh in a five-set thriller last Thursday to win the league title, completed the women’s treble with a 3-0 final win over first-time finalists City of Edinburgh.